Find out why the Bella + Canvas 3413C Unisex Tri-Blend Short-Sleeve T-Shirt is one of Bella + Canvas's best selling tees. Blended with 50% polyester, 25% combed and ring spun cotton and 25% rayon, this shirt has all the components of a luxuriantly soft and lightweight top. Classic cotton allows for moderate airflow and can withstand wear. Polyester retains colors well, is incredibly durable, and lends just enough elasticity for you to move and flex unencumbered. The added element of fine, silky rayon creates a breathable barrier between your skin and the fabric, allowing for more heat to escape so you stay cooler. The classic crew collar flatters both male and female necklines, along with a loose and comfortable modern fit . Unisex sizing allows you to place one order for your whole crew, in 36 bold color choices. 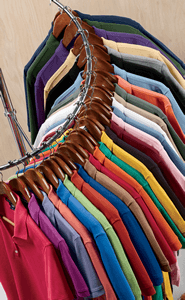 With a thread weight of 40 singles, you will enjoy the light feel of this tightly woven shirt, weighing a mere 3.4 oz. Read the article "Try It in a Tri-Blend T-Shirt"